What’s a food trip without dessert? Or at least something sweet to keep your energy up for all the miles’ worth of exploring. Here are some of the sugary bits that kept me happy in Barcelona and beyond. 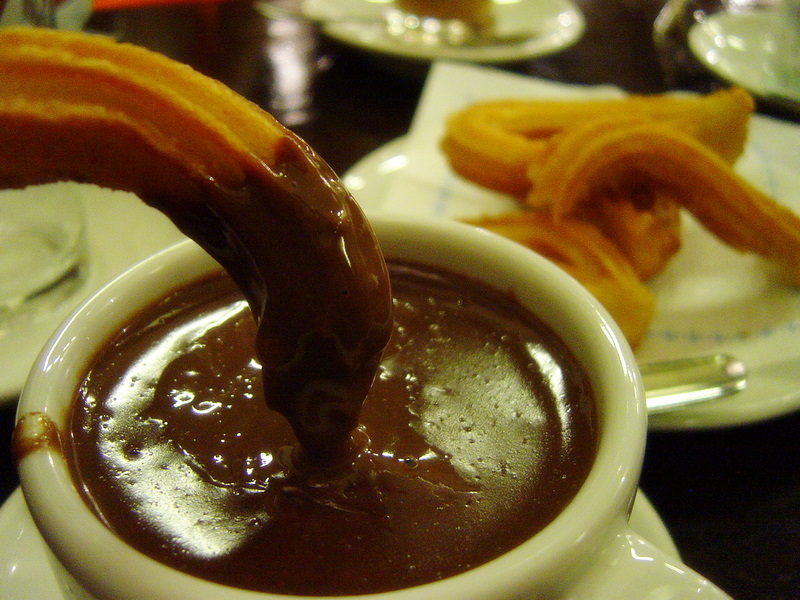 This is the place for that traditional chocolate con churros you associate with Spain. This little granja (meaning ‘farm’ or ‘dairy’, what Catalans refer to as a ‘milk bar’) has been around for a long, long time, tucked away in a narrow lane among the warren-like streets of the Barrio Gotico/Catedral area. The chocolate is so thick and unctuous you can practically eat it with a spoon. Definitely an experience not to miss.They are on Carrer de Petritxol 2. Tel: 933026824. Going out of the Placa del Pi just turn into Carrer de Petritxol. Barcelona has some very talented chocolate makers that can definitely hold their own among the best out there. Some of these are what I buy ever time I go (and what I ask for from my kind relatives when they visit Manila) and some I tried for the first time on this trip. Kokoa – These guys carry my all time favorite truffles (shoulder to shoulder with Maison de Chocolat). Don’t let the shiny gold wrapper, bright orange ribbon, and little flower on top fool you. Inside those foil wrappers lay individual hearts of darkness that can bring you to your knees. Despite the truffles being made from dark chocolate, they are called “Trufas de Vainilla”. You will find Kokoa in on the basement of Diagonal Mar (two stores away from Toys R Us, kind of across Alcampo supermarket). Diagonal Mar is a shopping mall on Paseo Taulat and Josep Pla, or on Diagonal and Josep Pla. You can take the yellow line of the metro to the stop Maresme/Forum. Vilaplana – This is where my cousin discovered catanies, and although I am not really fond of white chocolate, even I eat these little treasures. The catanies are caramel coated almonds covered in white chocolate and dusted with unsweetened cocoa powder. They are a delicious sensory mix of different tastes and textures – first the cocoa powder coats your mouth with unsweetened chocolate, then comes the smooth, milky white chocolate rebuttal, followed by your teeth cracking the sweet caramel coating, and finally the nutty goodness of the almond to round things off. These are my mom’s favorite and what we brought home for her. 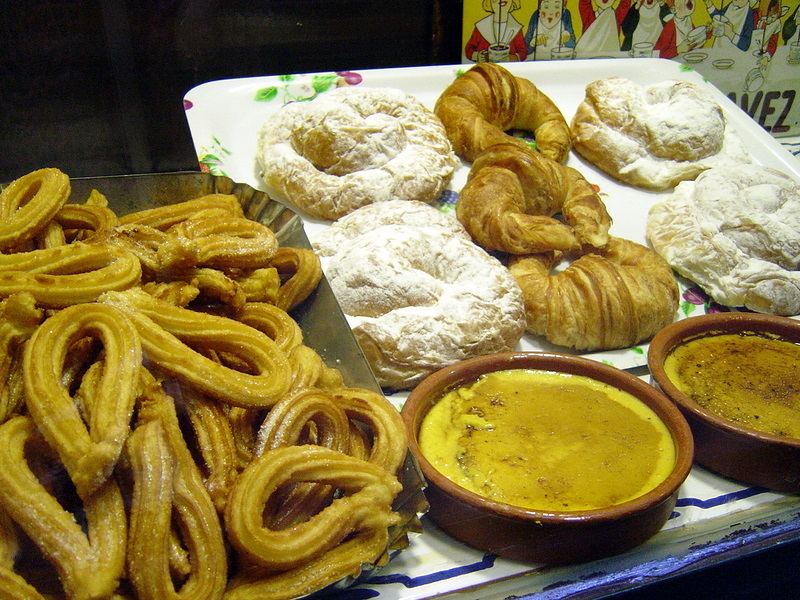 They are on on Plaza de Sant Gregori Taumaturg and Carrer Francesc Perez Cabrero near Turo Park. Blanxart – This was a small bar of dark chocolate I got simply because I liked the medieval looking wrapper (I can’t help it, I like pretty things). It was a good, solid dark chocolate. We brought some back but it is now long gone, heehee. 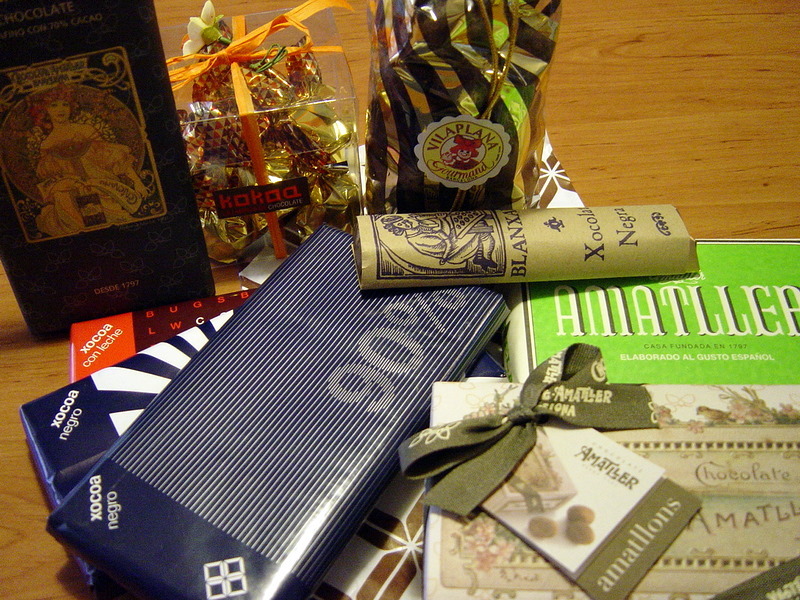 You can get Blanxart in a lot of specialty shops and chocolatiers about town (including the airport). Xocoa – This was another new taste. I wanted to check this place out after hearing so much about it. A true Barcelonan venture, they are a happy marriage of age-old quality with a hip, modern delivery. The look is cool and retro and the selection runs the gamut from plain white, milk, and dark chocolate, to delicious and innovative flavor pairings. We got the milk chocolate with cacao nibs, dark chocolate with green tea (intersting! ), and 90% cocoa dark chocolate (whoa!). You can find them at Carrer d’En Bot 4, Tel: 933188991 or Carrer de Petrixol 11, Tel: 933011197. They also have a small branch at the L’Illa mall. Amatller – Casa Amatller is one of the three buildings that make up the famous “manzana de la discordia” (block of discord or apple of discord). The “manzana de la discordia” is made up of what is said to be the three finest modernist buildings in the entire city: Casa Batllo by Antoni Gaudi, Casa Amatller by Josep Puig i Cadafalch, and Casa Lleo-Morera by Lluis Domenech i Montaner. The three buildings can be found side by side on the Passeig de Gracia, each stunning façade competing for your attention (hence the discord). The building was bought in 1898 by chocolate industrialist Antoni Amatller, and you can buy their chocolates inside. Entranced by their gorgeous packaging, delicious looking offerings, and the girl at the register telling me my Spanish was very good, we happily purchased the following: Amatllons (which are what they call their catanies), more dark chocolate, and a block of chocolate for drinking (which is their own special blend with a touch of cinnamon). You can find them at Passeig de Gracia 41. We visited Cadaques, the lovely seaside village where Salvador Dali lived, during our road trip along the Costa Brava. Unfortunately, as in our wedding, it wouldn’t stop raining. To make things a little more, um, exciting, this little gem of a town is found at the end of a winding mountain road…not the best place to be during inclement weather, especially with the fog fast approaching. But we pressed on, it was our honeymoon after all, and what’s a little adventure right? We searched for the tourist office where we could pick up our tickets for our entrance to Dali’s house, only to find the office closed. Wet and soggy, we trudged around the town, taking silly pictures of ourselves and our umbrella. And we bought taps. 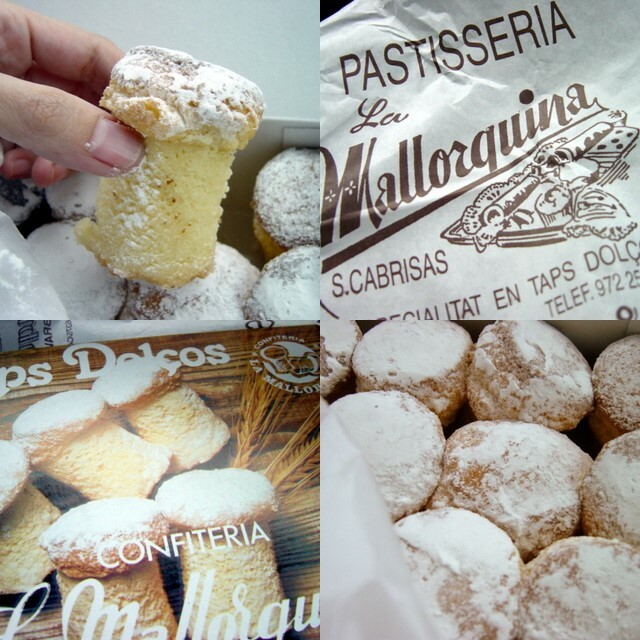 Taps, a specialty of Cadaques, are like little sponge cakes shaped like champagne corks, powdered sugar dusting their heads. They are sublime! Light, tender, and sweet, the sides still moist and sticky with sugar, they were exactly the remedy for a cold rainy day. Anyone who goes to Cadaques should not leave without a box. You can get them at most bakeshops there. « This just in: Box of Goodies from Spain!